Meredith Merton and her duck Issanah. Despite a ninety-year sports rivalry between the OSU Beavers and the Oregon Ducks, doctors and staff at the OSU Veterinary Teaching Hospital are committed to saving the lives of all animals, even ducks. Especially when a badly injured duck belongs to a young girl who is very fond of her pet. Last month, they found Issanah bleeding from multiple throat lacerations. April Merton thinks she may have been mauled by a racoon. “We’ve had problems with raccoons,” she says. “They opened the latch on the hen house and killed some chicks.” Meredith was very upset and asked her dad if they could take Issanah to a veterinarian. He agreed and they rushed her to the OSU veterinary hospital. Usually, the hospital refers avian medical cases to a private practice veterinarian. But when the Mertons showed up with Issanah, Dr. Jorge Vanegas made an exception because the duck’s injuries were severe, including a lacerated esophagus and fractured right wing. He sedated Issanah and sewed up her neck with dozens of small stitches. “It was difficult,” he says, “because there is so little skin and muscle in a duck’s neck.” Then he set the wing with two tongue depressors for a splint. 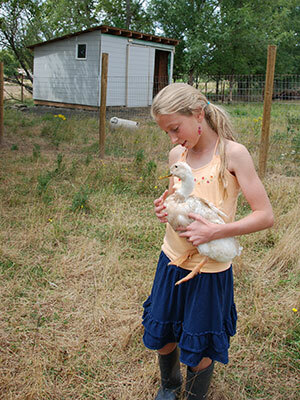 Fortunately, student Katelyn Hollars was on duty that day and was familiar with raising ducks. “She was very helpful,” says Dr. Vanegas. “She helped calculate the medication dosage and wrapped the repaired wing next to the duck’s body.” He sent the Mertons home with an antibiotic to add to Issanah’s water, and instructions to keep her quiet and confined to a small area. Meredith took extra good care Issanah, but one small hole in her throat was not healing well, so Dr. Vanegas added more stitches on a follow-up visit. That did the trick. “I wasn’t sure if she would make it, but I guess ducks are tough,” he says. Now Issanah is doing great, scurrying around the farmyard with the other ducks in their little family group. “She went right back to laying eggs,” says April Merton, who now has an incubator with eggs from two ducks; the white ones with brown speckles look just like their mom Issanah. When a coworker asked Kirk Rogers if he was interested in adopting a dog, he said, ‘Probably not.’ Then he saw Rusty’s happy face and big, goofy feet, and fell in love. Rogers took Rusty home that day. Rogers was not the only one to fall for Rusty’s charm. The two-year-old Bassett Hound-mix makes friends wherever he goes. On a recent visit to the OSU Veterinary Teaching Hospital, he trotted into the lobby and immediately went around the room saying ‘Hello’ to everyone by politely standing in front of them and wagging his tail. “To him, everyone is a friend,” says Rogers. Rusty was feeling especially good that day because he had recently resumed normal dog activities. Just two months earlier, a seizure left Rusty unable to move his two right legs. When Rogers adopted Rusty, they started a daily routine, taking one or two walks where Rogers allowed the dog to follow his nose. As a scent-hound, these walks were Rusty’s favorite activity. But a few weeks after settling into his new home, Rusty started acting like his neck was stiff and sore, so Rogers took him to a veterinarian who prescribed NSAIDS and rest. Rusty got better. Then it happened again a month later, and periodically after that. Top: An MRI shows the fractured vertebra in Rusty’s backbone. Bottom: The repaired vertebra after surgery. One day, while out on a walk, Rusty had a seizure, collapsed, and could not get up. 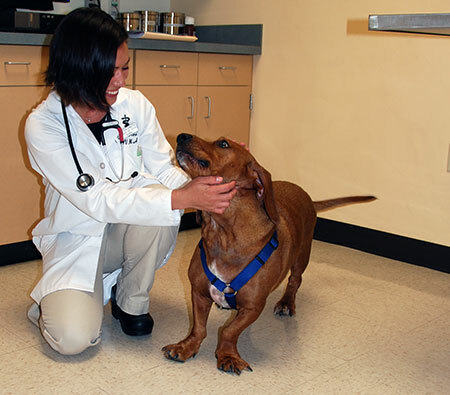 Roger’s immediately took him to his veterinarian who referred him to the OSU Veterinary Teaching Hospital. There, orthopedic surgeon Dr. Wendy Baltzer ordered an MRI which revealed a fracture of the C2, the second cervical vertebra in his neck. The C2 forms a pivot upon which the C1 vertebra, which holds up the head, can rotate. 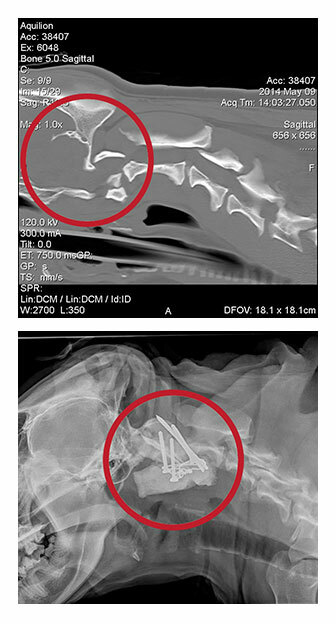 The C2 fracture was causing dislocation of the two vertebrae and resulting in a severe compression of Rusty’s spinal cord. Dr. Baltzer recommended surgery. The atlantoaxial joint, in the upper part of the neck, lies between the first and second cervical vertebra; it is a complicated set of bones and ligaments. Dr. Baltzer stabilized this joint using four screws, two wires, and bone cement, effectively fusing the C1 and C2 vertebra together (see image at right). 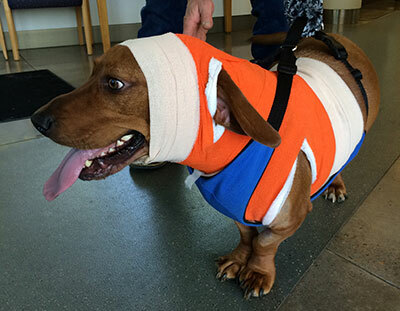 Following surgery, Dr. Baltzer placed a brace on Rusty’s neck and, for 72 hours, the hospital ICU closely monitored him for any sign of spinal cord swelling or breathing difficulty. Overall Rusty did really well and soon began standing, and even taking short walks. Rogers was able to take Rusty home with instructions for seven weeks of gentle physical therapy movement. But, to allow his neck to heal properly, Dr. Baltzer advised strict limits on Rusty’s activity. This meant keeping the dog in a kennel for a large part of the day, and allowing him no walks other than potty breaks: not an easy task for the owner of an energetic hound. “It was really difficult keeping a nose-dog confined to a small kennel, even with anti-anxiety medication,” says Rogers. Finally the two month ordeal was over and the happy day arrived: x-rays revealed that Rusty’s neck was healing nicely and the neck brace was removed. Dr. Baltzer released him to normal dog activity, even running, but cautioned Rogers to restrict play with other dogs. Rogers is happy to have his best pal back on the trail. “I really missed our daily walks,” he says. Rusty in his orange-wrapped back splint. Go Beavs!